The decision on how we become a republic is too important to leave to the politicians. This is a ‘work in progress.’ Please contribute your comments at the bottom of each page. Your suggestions will be considered and if useful will contribute to the concept will be worked into the model. Expect these pages to evolve! Should the Prime Minister have sole power to appoint the Head of State? Should the people be allowed to elect the Head of State? 1. The Margavie Model: Is preferred by politicians because of its minimilist approach, but unfavoured by the people for the lack of direct involvement in the process. 2. Direct Election Model: There are several models that allow direct election by the people, but to the many politicians there are justified concerns that one person could be seen to have too much power. 3. Bi-partisan Model:The model decided upon by the Constitutional Convention for the Referendum of 1999 and was rejected by the people. Contrary to the monarchists claim that Australia did not want to be a republic, the electorate showed enormous courage and wisdom in rejecting a model that was totally unsatisfactory to them. Australia has a Federal Government based upon the British Westminster System. In this system, there are regions known as electorates (or seats) where the registered voters may cast a vote for a person to represent them in the House of Representatives. The party that wins the more than 50% of the seats outright; or can form a coalition with another party &/or independent(s) to control more than 50% of the seats, can then form a Government. The head of the successful party becomes the Prime Minister and as such the main political leader of the country. But while the Prime Minister (PM) may be the head of the Government, he is in effect, only responsible to his local electorate. It is the PM’s own electorate, that ultimately decides the fate of the PM, not the People of Australia. It is possible for a party to win government, and the local electorate to reject the leader of the party – the PM finding himself without a seat, and out of a job. The party that has a the most number of seats that could not form a government, becomes the Opposition and the party leader becomes known as the Leader of the Opposition. The States of Australia have a similar system – except the leader of the governing party is known as the Premier. The Prime Minister and the Government should be able to carry out the will of the majority and govern with minimal interference from outside the Parliament. In the Westminster System there is no one person who is elected by the nation and as such, having enormous political power of “Popular Election” . Therefore, to have a Direct Election Model where all Australians vote for a HOS will result in literally millions of votes and could be viewed as giving one person too much political clout. This is unacceptable and contrary to the Westminster System. On the other hand, in an era that is no longer the 1800’s, with all people over the age of 18 being entitled to vote, many Australians demand a say in who is going to be their Head of State. The real reason that the referendum to become a republic in 1999 failed was not because the majority of Australians are monarchists. It was rejected at Referendum because the minimalist bipartisan model that was presented to them was unacceptable because the electorate did not have a say. 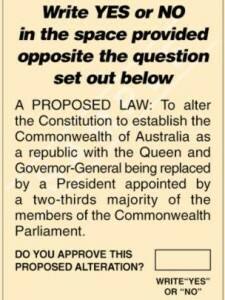 The ballot paper to the right clearly shows that the Commonwealth Parliament would solely responsible for appointing the President. Simply put, Australians want to have a say but until a method is reached where the people and politicians both have a say in who becomes the Head of State, it is likely that the impasse will remain for sometime. The SEM is a compromise that both the people and politicians would find acceptable. It is also one that would be uniquely Australian and would give a “fair go” to both the people, politicians and Parliaments of Australia. In this model, the people elect their candidates on a state by state and territory by territory basis. When the 8 candidates have been elected, Parliaments of federal, state and territorial governments have a combined meeting to elect the Head Of State from the 8 candidates presented to them by the people. If this model is deemed acceptable to the people of Australia and the politicians, it is then up to the politicians and constitutional lawyers to create the constitutional laws needed to bring it to reality. This website is putting up an alternative framework for discussion and asks Australians to contribute their ideas to bring about the reality of the Australian Head of State being an Australian. rather than the existing title. This will give an accurate title to the photograph and leave out a somewhat obscure historical date. You could, perhaps, make up a paragraph, section or page of the basic history of the establishment of the ACT and the subsequent building of the Capital and parliament buildings. Hi julian, thanks for your input. Yes, as stated, the photo is of the new Parliament House in Canberra, A.C.T., opened by our glorious monarch and Queen of Australia, Elizabeth II, in 1988. The obscure date you mention is when the A.C.T was founded. The dates on the other photos are the years when that State or Territory was founded. As far as this site presenting detailed information about the states and territories and settlements that became cities, people if they are curious to find out more can ask Mr. Google. There is no need for this site to duplicate that information. If you had not noticed, all the photos at the top of a page feature a different State or Territory and the date of founding. About(8): Uluru. Northern Territory founded 1911. I am intrigued by this model. I believe that the HOS should be chosen by both the people and the parliament so this model seems like it may work. I would be interested in seeing a flowchart or diagram showing the process for the choosing of HOS from the nomination to the final confirmation. 2. The candidates are voted for at a state or territory level so that each state and territory has a representative. (ie 6 states & 2 territories) It is done in the preferential system. Once the people have selected their (8) representatives at a state territory level, its up to the politicians choose a HoS from the represenatives the people have given them. 3. The Selection of the HoS is done by a combined number of all the Lower Houses of Parliament – State, Territory and Federal. The combined politicians start the procedure by eliminating or voting OUT the least preferred candidate. (i.e Who do you NOT want the most – or who do you want least.) There will be several rounds of voting until down to 2 final candidates. For the final 2, there will be a final vote FOR HoS, with runner up being Deputy or Vice.